The Epidermis. Epidermal cells (E) with thick walls and cuticle. The guard cells are sunken and attached to prominent subsidiary cells. The Hypodermis and mesophyll. The outer cells of the ground tissue are differentiated into an hypodermis (H) and is sclerenchymatous. Many of the remaining cells (mesophyll) of the ground tissue have internal ridges projecting into the cell lumina. 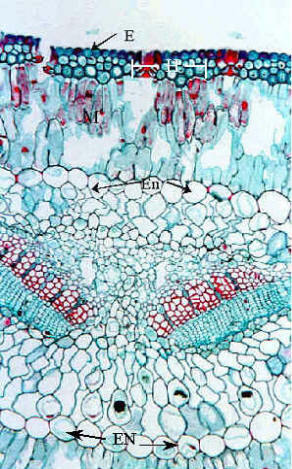 In transverse sections the mesophyll appears compact but longitudinal sections would reveal prominent intercellular spaces. Most pine needles contain two or more resin ducts. The Vascular tissue. There are two vascular bundles in the needle, which are surrounded by a transfusion tissue. 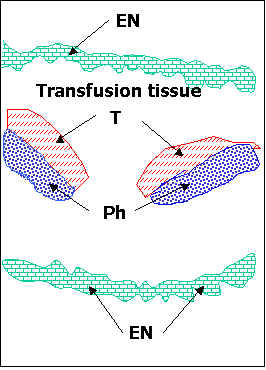 Transfusion tissue is composed of tracheids and parenchyma cells. The transfusion tissue is surrounded, in turn, by a conspicuous endodermis (En) which is the innermost layer of ground tissue. The endodermal cells in your slide have somewhat thickened walls, especially the outer tangential wall, which contains conspicuous simple pits. At one time these endodermal cells contained a well-developed Casparian strip. Study the diagram below the micrograph, to help orientate you in your examination of the fairly complex cell and tissue arrangements in the pine needle. Ph = phloem (sieve cells and albuminous cells or Strasburger cells; T = Tracheids. Question: What features, visible in the micrograph above, confirm this as an example of a gymnospermous plant? Click here to have a look at the anatomy of a pine needle at an early stage in its development.